It’s been a few years since we proudly announced that Tullow Oil PLC had signed up to Arc, our insider management solution. Since then we’ve been working closely together to support the Tullow Company Secretariat team with their insider management and communications. The Stitch insider management solution means Tullow can be confident their insiders fully understand their obligations, helping to ensure their compliance under the Market Abuse Regulations. Tullow Oil PLC is a multinational oil and gas exploration company founded in Tullow, Ireland and headquartered in London. With interests in 90 exploration licences in 16 countries and over 1,000 people, the business is diverse and employees are scattered around the globe. Tullow employ scientists, engineers, technicians, project managers, finance and operation teams each with different needs and interests. Given the sensitive nature of the business, all Tullow Oil employees are made insiders from the moment they start working for the company. The possible discovery of new sources of oil, changes to existing supply, oil demand, political unrest, and M&A activity can all have an impact on the share price, and insider lists frequently change. The solution: Tullow’s Insider Management software and communications solution was rolled out globally for all Tullow employees in 2016. The solution gives the company secretariat team all the tools they need to securely track, record and manage their insider lists. 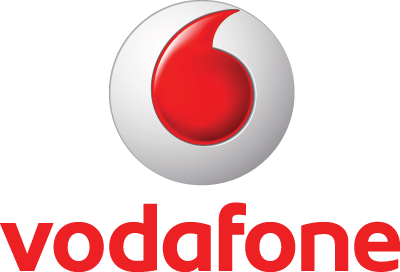 Tailored communications support and inform users so that everyone understands their responsibilities. Tullow can centrally control permanent and project insider lists, devolving responsibility across the business as needed. 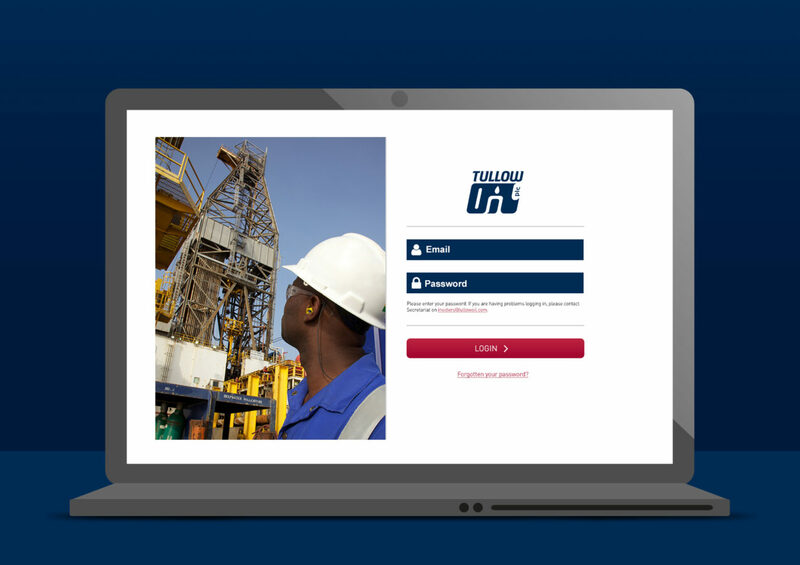 The solution is available on desktop, laptop, tablet and smartphone, so Tullow list owners, administrators, approvers and insiders can use it on any device, anywhere, anytime. 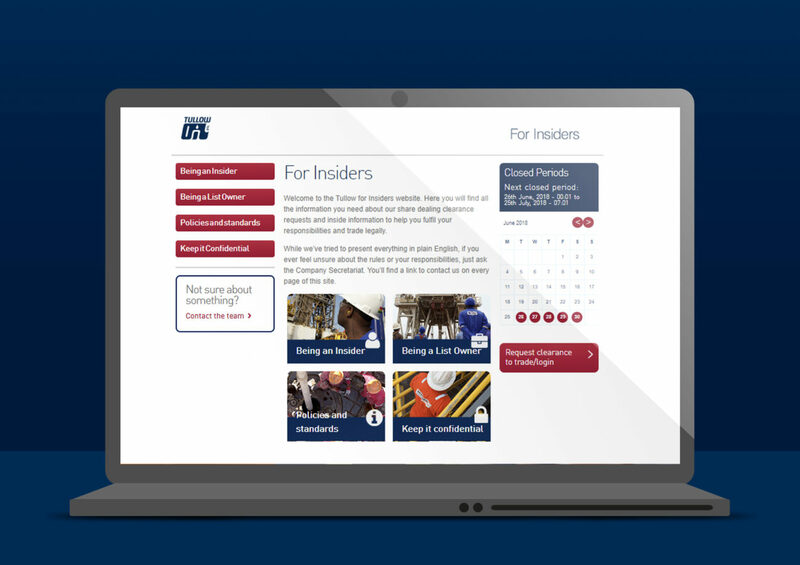 Communications: We also designed, developed and wrote the content for a Tullow Oil Insider Management website. It helps employees understand what it means to be an insider and an explanation of the insider processes. The site also helps employees understand the wider responsibility of confidentiality and compliance. Tullow have nearly 80 email templates covering the full range of activities from requesting clearance to confirmation of which project list an employee has been added to. Each email is Tullow branded, written in their tone of voice. Personalised employee communications are logged against each insider record. We even gave Tullow Company Secretariat Admins the ability to create ad hoc message and events specific communications, on-screen prompts which can be shared and sent to any combination of employees in the database. A full audit trail means that Tullow can check that emails have been sent, undelivered, opened and bounced. Summary: Our insider management solution gives Tullow Oil total control of their insider lists, communications and clearance requests. The simple to use, web-based solution means they can be confident their data is safe and secure at all times. The list of requirements Tullow gave us all those years ago was long, but we’re confident we’ve achieved their objectives and have delivered what we think is a best-in-class solution. Arc, the insider management solution from Stitch, is used by some of the UK’s leading companies including one of the big four banks. If you’ve not seen Arc in action before (or have but would like to see what it looks like now) get in touch with Jane, or give her a call on 07787426375 to find out more or arrange a demo.